Today we would tackle Kilburn. We were a merry band of five and five pubs were in our sights: The Westbury, The Priory Tavern, The Betsy Smith, The Black Lion and the North London Tavern. Yes, yes, before you all start ranting, there are other Sunday lunches available, but we couldn’t do all of them in one day and we opted for the pubs that people generally talk about. And frankly we didn’t want to think too hard about what went into the £4.99 offer at The Bell. All the pubs had been told we were coming and all but The Black Lion had replied and reserved us tables. Is the Westbury’s hubris justified? Bloody Marys in hand we took stock. 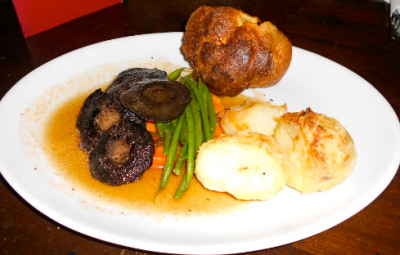 Our methods were simple – one roast beef in every pub and one other meal from the Sunday lunch menu. Between us. Not each. We’re not made of lycra. Here at the Westbury, which rather boldly claimed outside that it did the best roasts, we opted for the veggie dish – mushrooms. This was a transparent and futile attempt to make us feel good about the amount of meat we were going to consume. 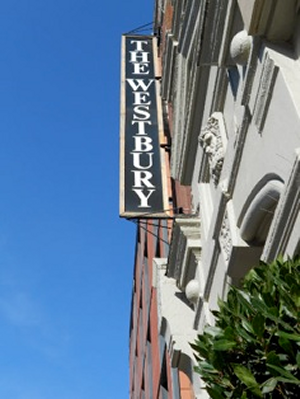 Not everyone knows the Westbury, I realise. During the daytime it’s a pretty nice spacious pub with lots of comfortable seating. It opens at 12 on Sunday, so we’d been sat outside on benches on the High Road like alcoholics desperate for the pub to open. We did have to wait a little while for our food, but we’d ordered just after a table of four, so we can forgive the kitchen for being a little sluggish so early in the day. What of the food. So this doesn’t get incredibly dull I’m just going to pick up on the main points! Beef (Lancashire rib eye) was good – one of the better beefs in fact. The Yorkshires were average. The carrots were delicious (best carrots). The potatoes were… well, Tom will get annoyed if I call them inedible, and strictly speaking they were edible but they were the worst of what was frankly a bad bunch of potatoes across all five pubs. So, high marks on beef, low marks on potatoes. Good gravy (and we were offered extra when served). 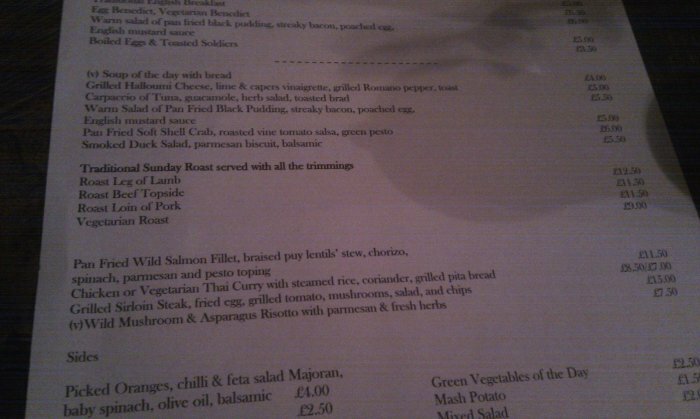 The mushroom dish tasted fine, but looked pretty underwhelming for £9.95 – we’d been imagining three really large mushrooms roasted with herbs and looking like they were any match for some roast beef. What we got was a four or five rather black looking mushroom discs that would have been quite nice as a mushroom side dish, but didn’t cut the mustard (also on the table) for a good veggie Sunday lunch. The welcome was warm as usual and the place was busy, so landlord Merlin warned us there might be a bit of a wait, although in reality it wasn’t noticeable. We ordered beef and lamb here. 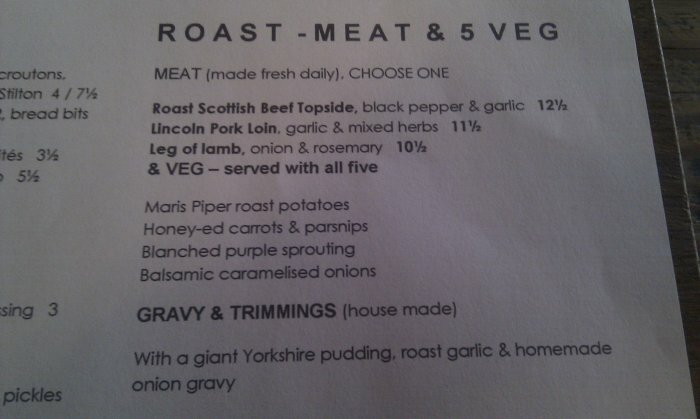 The Priory is the only place that said on the menu which butchers its meat comes from (Josh Pettit & Hillman’s). While we discussed the challenges of food waste – to doggy bag or not to doggy bag – we opened the house red (the first of the day’s many Tempranillos). Our food arrived – the potatoes were better, but still too soft. 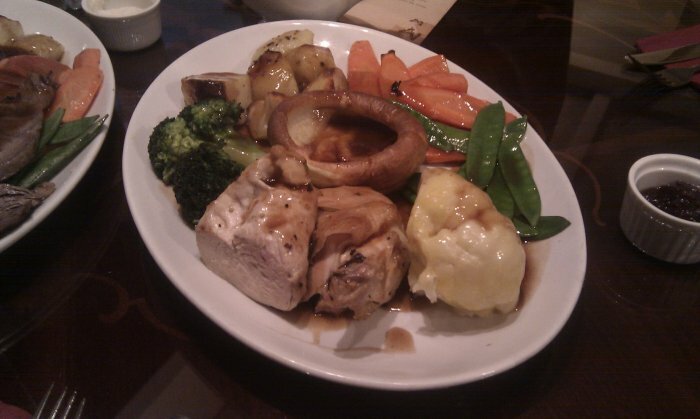 However, overall, the Priory offered the best vegetables of anywhere we went in both Kilburn and West Hampstead. The beef was definitely chewier than at the Westbury though perfectly pleasant. The lamb however was really good (I may be a bit biased here as I love lamb), tender, sweet, and the right amount of rosemary. 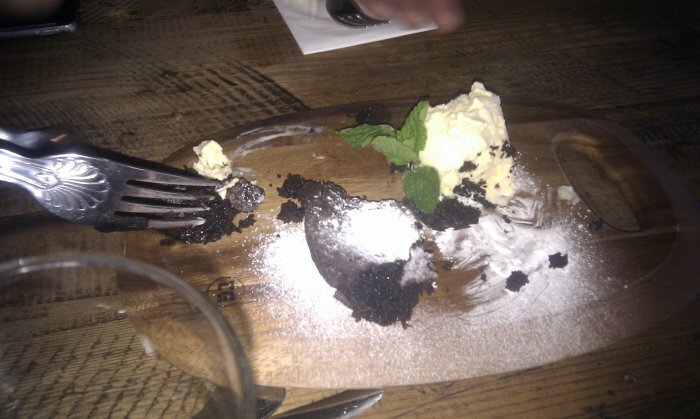 The pub was “between mint sauces”, but did its best with a sort of makeshift mint sauce. The yorkshire puddings divided opinion. 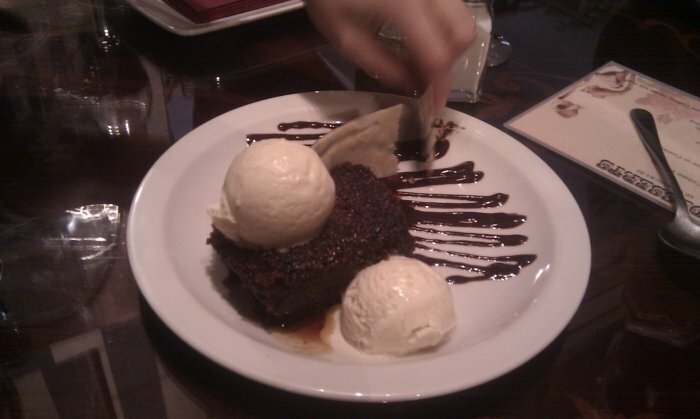 We also decided it was time for a pudding and promptly gorged ourselves silly on a perfect (not a word I use lightly) chocolate brownie with ice cream. We have commented before on the Priory’s misguided fondness for chopping boards instead of plates. So I won’t mention it again. Just imagine what happened as the ice cream melted. The strange Narnia meets Alice in Wonderland design of the Betsy Smith meant that this was the only Sunday lunch we were gong to have sitting in a wardrobe. It was lunch number three and by now we were a well-drilled team. The house red was ordered even before we’d sat down. 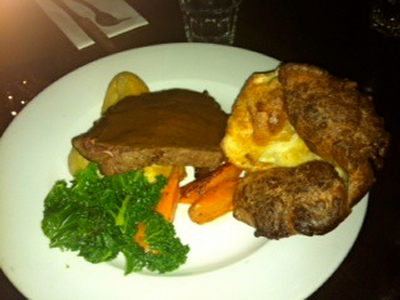 Then it was beef and our first roast chicken. Huge bonus points for hot plates – apart from Anna who for reasons only she can explain prefers cold plates. Also the staff were on the ball enough to offer us each a plate rather than having us all attacking the two roasts like starved hyenas. Betsy’s chicken wasn’t a triumph – it was nicely presented, but was a little dry and bland. The potatoes were once again a step in the right direction with a crispy outside, but a little heavy inside. Both plates came with mange tout, which seemed incongruous, and a side dish of cauliflower cheese. 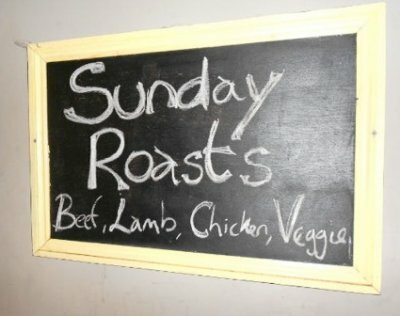 The beef was better than the chicken – nothing to write home about, but here’s the kicker: Betsy Smith’s roast is under a tenner. It’s cheaper than everywhere else, and perfectly decent. The wine (another Tempranillo) was also pretty decent. So much so that we had a second bottle with a top-drawer sticky toffee pudding. There was no room in the bar at the Black Lion so we had to go through to the fairly recently remodelled restaurant. It’s nice, but not as nice as the bar. Beef and pork was the order of the day here. We were starting to flag slightly at our fourth pub, but another bottle of Tempranillo soon revived us (once it had reached room temperature). Overall, this was a good Sunday lunch, or would have been without the red cabbage (at least for me – it had soaked into the gravy making everything a bit too sweet and acidic). We ordered roast pork, which was nicely cooked but a little bland. It was also pretty much gone before I had the chance to take a photo. The Black Lion was the first place that asked how we’d like the beef – and more or less got it right – in fact the beef itself was quite good. The veg was not great: most of our carrots were burnt. 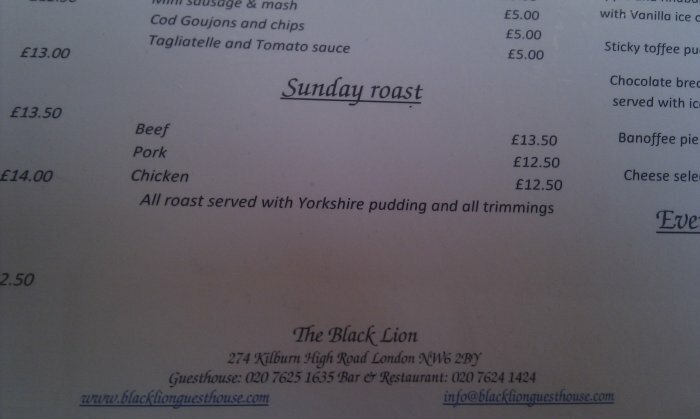 However, the Black Lion had better potatoes than most places and a good yorkshire. 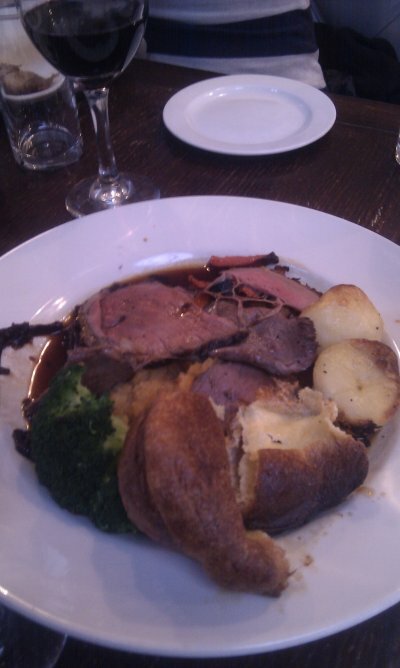 Dom and Anna’s favourite roast beef in Kilburn. There was a distinct sense of acheivement as we arrived at the NLT. Like great explorers we had experienced adversity (those Westbury roasties), elation (delicious lamb), and had bonded over more bottles of red wine than was clearly advisable based on current government guidelines. We planted a flag in the table and settled in for the rest of the evening. Expectations among some were high. Others (me) had been underwhelmed by the NLT’s food before. 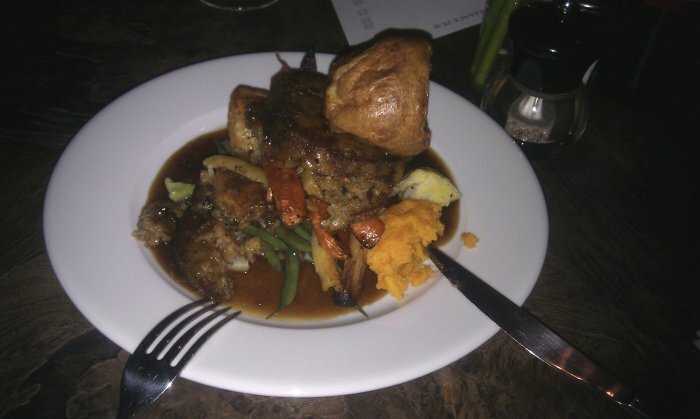 It was the most expensive of Kilburn’s roast dinners – would it be the best? Along with the beef, we had salmon for a change. I confess that by this stage my notes are slightly harder to read and not quite as extensive. 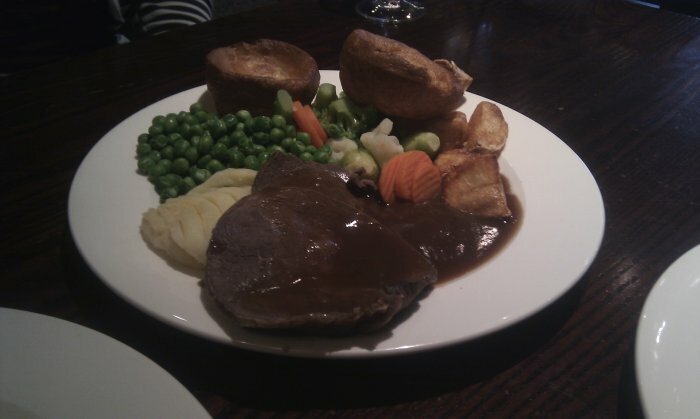 The beef split the room – Tom liked it, I felt it had good texture but lacked flavour. It was one large thick slice of beef rather than a few thinner slices. Portions were generally notably smaller than elsewhere. The salmon was nice, if perhaps slightly overcooked. The NLT did deliver the best yorkshire pudding of the day though. We treated ourselves to more (quite a lot more if my hazy memory recalls) red wine (another Tempranillo blend) and puddings that we got to eat all on our own without clashing cutlery with each other. 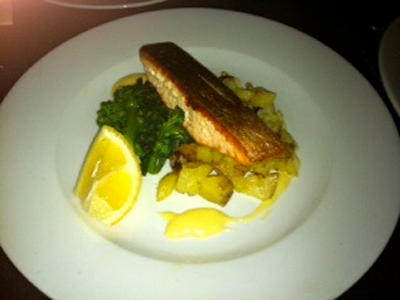 The salmon was Anna’s favourite overall dish. Kilburn summary: Nothing outstanding, but everywhere had something going for it. 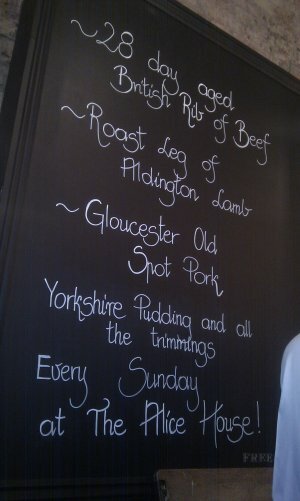 The lack of agreement on what was the best roast dinner here shows that it’s hard to recommend anywhere as outstanding. 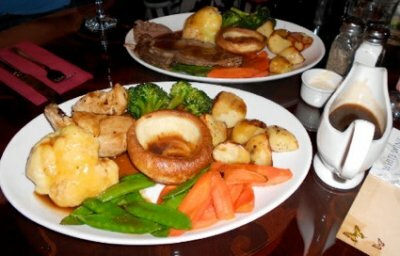 It also suggests that given that the cost of a roast beef lunch varies by £4.50 between the Betsy Smith and The North London Tavern, value for money and general atmosphere probably carries as much weight as quality of food. There were just four of us for this installment of our Sunday lunch taste test. This would mean more food each, more wine each and less ranting by absentee Dom about the state of roast potatoes. Under the microscope today were The Gallery, The Railway, La Brocca, The Alice House and The Alliance. We were back on home turf and we were hoping for a higher average standard. We bypassed The Lion, which was about to close for a major overhaul, but we’ve since been to its new incarnation as The Black Lion – what did we think? I’m an unashamed supporter of the food at The Gallery since they revamped the menu some months back. Therefore, I wanted our opening dinner to be good. The Bloody Marys once again got us limbered up for the task ahead. Along with the beef we opted for the poussin. Right off the bat we were happy whampers. 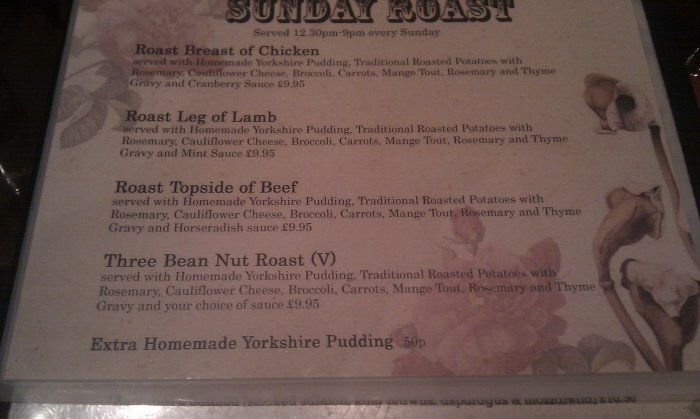 The potatoes were very good and the yorkshire was better than anything we’d had in Kilburn. 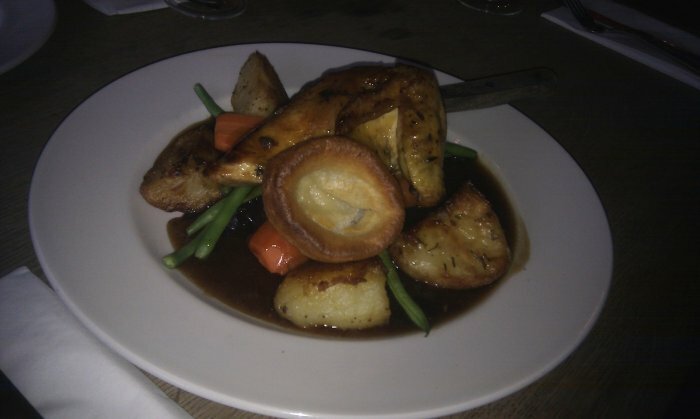 The beef was good but not great, but the poussin was perfect – juicy and tender with a good flavour on the skin. The veg were a little bit bland – they needed the kick of herbs or just more butter. Cauliflower cheese was a nice addition, although Claire was a bit sceptical that the cheese sauce was quite right. It was, very simply, a good start to the day. We weren’t expecting great things from The Railway to be honest, but we wanted to see what it could offer at the value-end of the market. 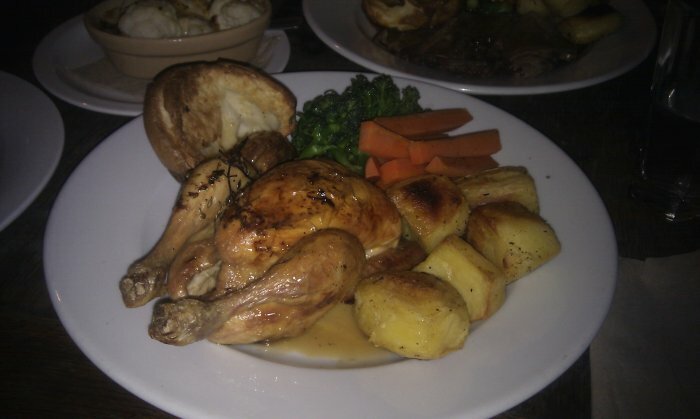 The Sunday roast options were beef or “chicken breasts”, but we decided to eschew the chicken – partly ‘cos we’d just had poussin and partly because none of us were entirely sure whether we fancied chicken from the cheaper end of the industry. So, we had scampi & chips instead. Lets get the scampi out of the way first – it was scampi. There. That’s it. It wasn’t bad at all – i’ve had much worse scampi. And there are some pubs in the area that would be better off with the Railway’s chips than the ones they make themselves. 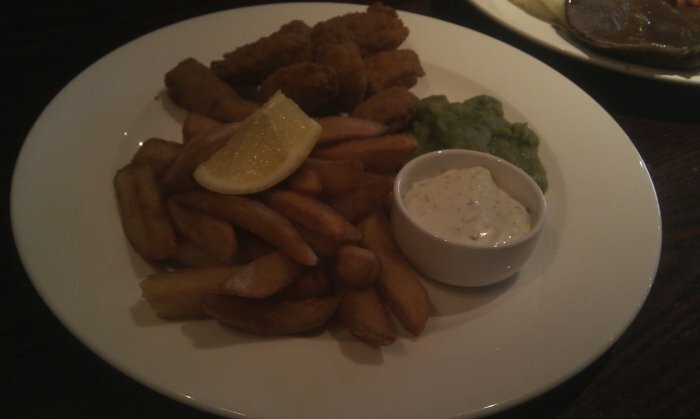 But that’s scampi and chips. 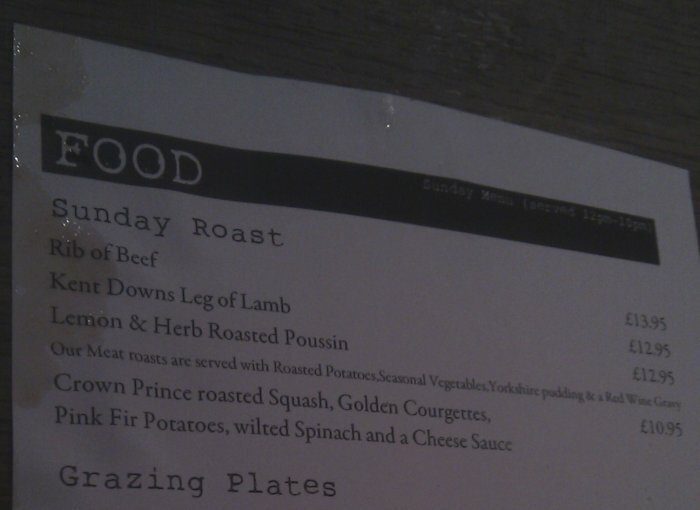 The menu had a picture of what our roast beef dinner would look like but actually it looked better in real life. Mash AND roast potatoes. And peas. We were a bit divided on this. 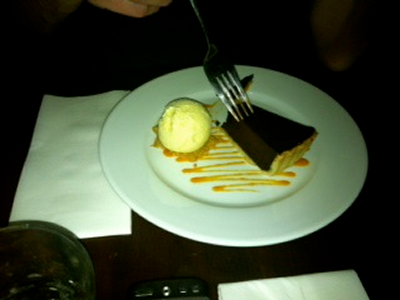 Anna in fact just declined to eat it but that was hardly entering into the spirit. It was cold, which wasn’t a good start. Not deliberately cold, but definitely not hot. It was borderline complaining-level cold, but we couldn’t be bothered and the gravy and other bits and pieces were hot enough. I felt that although it didn’t look hugely appetising, it actually tasted perfectly ok and I would happily have eaten it all. Tom and Claire were less convinced. 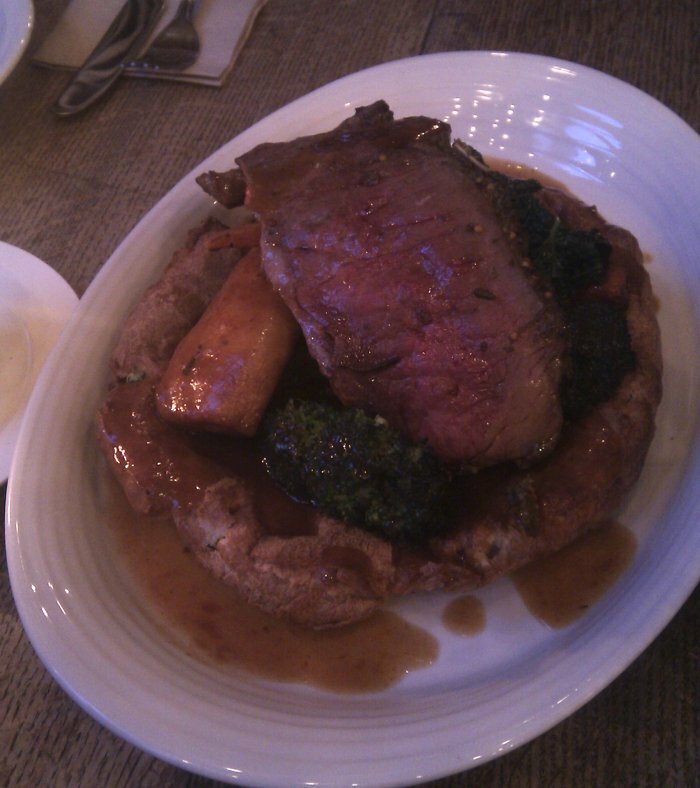 The accompaniments – well, I’d be lying if I said the Yorkshire pudding was good. The mixed veg would have been absolutely fine if they’d not been overcooked. There’s nothing nutrionally wrong with frozen veg, but they shouldn’t be soggy. However, the potatoes were actually pretty good (and came in both mashed and roast form) and there were peas and who doesn’t love peas? One thing that I will say about The Railway is that the service is always noticeably good – friendly, helpful and eager to please. 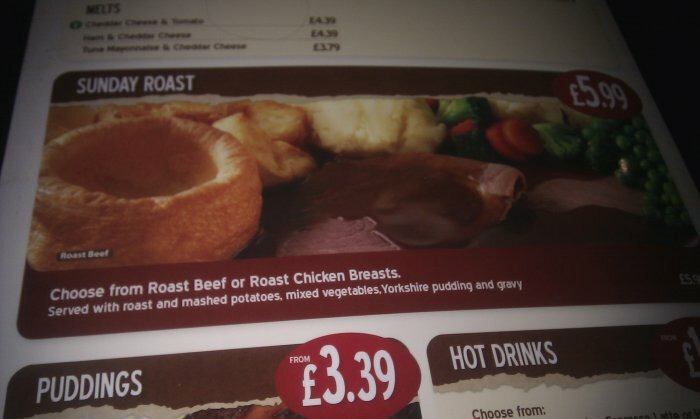 They’d even given us an extra Yorkshire pudding as Tom had asked nicely. Had we complained about the cold beef I’m sure they’d have been nice about it and sorted it out. Obviously this was a lot cheaper than anywhere else, but it’s only £4 less than the Betsy Smith, which had delivered a better plate of food. Tom practically lives at La Brocca but had never had Sunday lunch there, so we were all intrigued to see what the Italian-inspired kitchen could deliver. 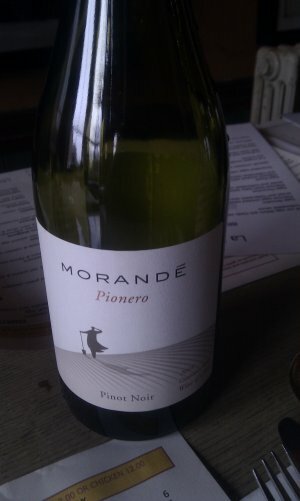 The Sunday roast options were chicken or beef, so we had both and branched out from the ubiquitous Tempranillo to Tom’s favourite Pinot Noir. 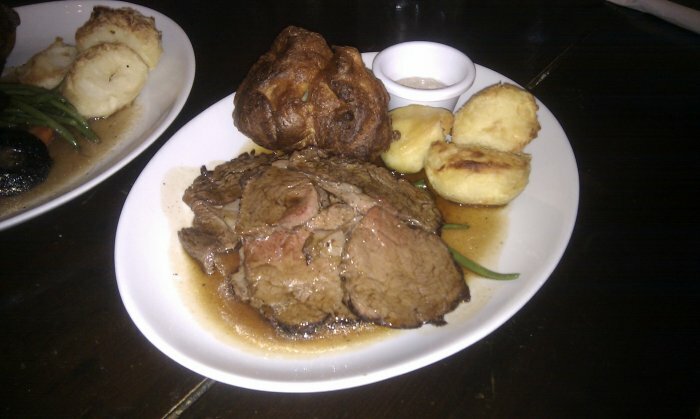 The beef had good flavour, but needed the gravy without which it was a little tough. The chicken – again, just chicken breasts which is no good for those of us who prefer legs – was also nice, but it didn’t excite us. The vegetables were average – perhaps slightly disappointing for a kitchen of this standard – and unsurprisingly the Yorkshire was so-so. But the roast potatoes… oh dear me the potatoes were almost as good as Dom’s mother allegedly cooks. As we had a bit of time before the Alice House would be ready for us, we indulged in a good sticky toffee pudding and an apple crumble that was a lot more apple than crumble, but tasted good nonetheless. The vibe is always good at La Brocca too, and although it was a mixed success, I could see myself coming back here for more of the beef (with extra gravy). The best roast potatoes in Kilburn or West Hampstead. Now, before we get into the food, I need to sort one thing out. When I’d e-mailed to book the Alice House I’d been told that the kitchen was closed from 4-5pm on Sundays, and they couldn’t guarantee there’d be any roast dinners left when it reopened. 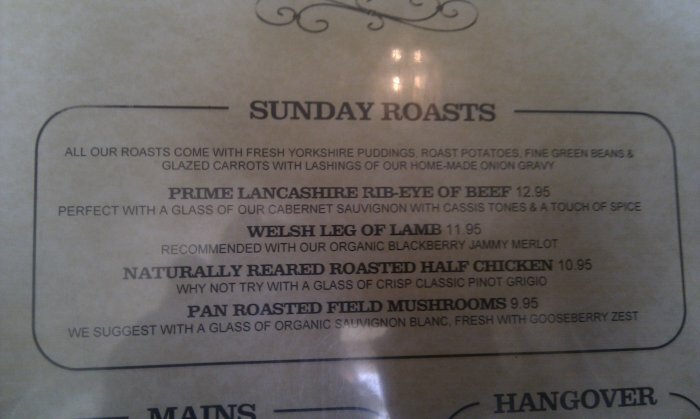 The website does in fact say that Sunday lunch is served from 12-4pm, which I hadn’t noticed. Nevertheless, it seems strange in an area rife with late Sunday lunchers, and it’s not hugely conducive to doing a review! Anyway, after a very amicable correspondence, we agreed that I’d pre-order the food so they’d keep two plates back for us, and then when the kitchen reopened at 5pm they could serve us. This meant weweren’t entirely sure what sort of state the food would be in. I’m delighted to say it was in an excellent state. 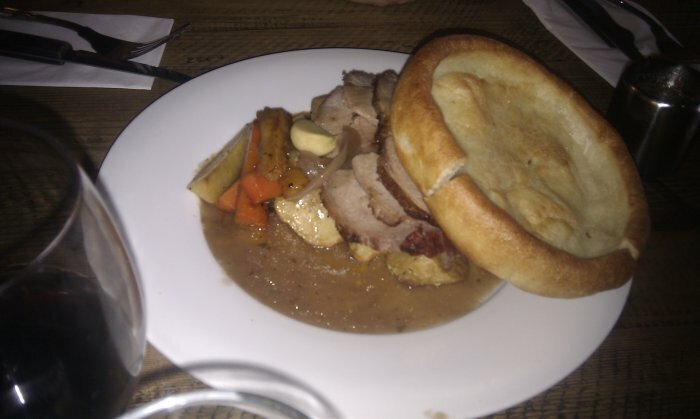 We had the beef and the lamb and for the first time we had a REAL Yorkshire pudding – that is a proper size one with all the beef and gravy and vegetables served inside. If we’re being very pedantic (and as someone who’s half Yorkshire that’s not just a right, but a duty), the yorkshire wouldn’t be served like this, it would be a separate dish, but this was a good approximation of the idea and it was good, although not quite as good as The Gallery’s. 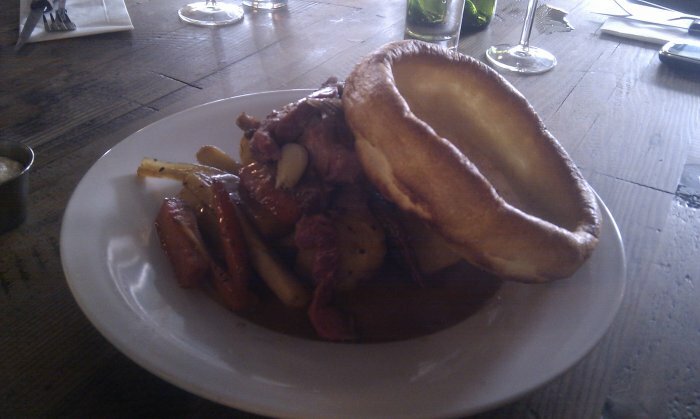 The beef was also top-notch, very tender and well cooked. 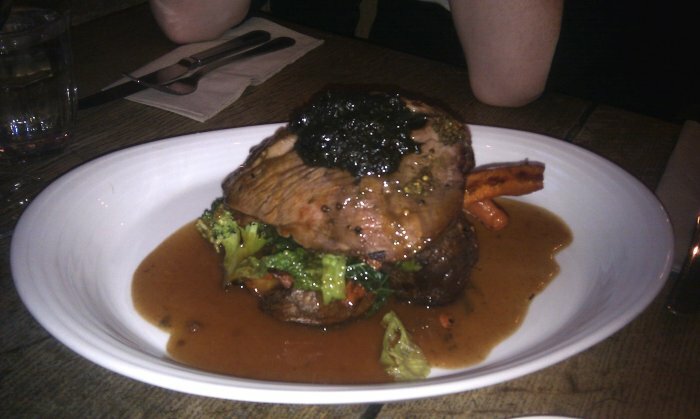 The lamb was good too, though not as good as the Priory’s for my money. There was a very good range of vegetables, but the potatoes divided opinion. Tom liked them, while the rest of us thought they were ok, and more like mini-jacket potatoes with a very thick skin albeit soft inside. So, the end result was that we left the Alice House pretty happy. But had we been lucky? I saw a tweet that evening from someone who – for the second week running – had been told at 2pm that they’d sold out of Sunday lunches and there would be a lengthy wait for the next batch to be made. 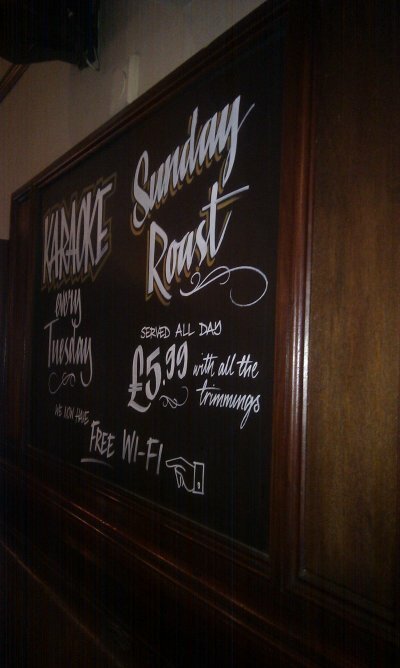 Surely, the AH must know that it’s going to be a popular place for Sunday lunch and can prepare accordingly? And if the food is always this good then they really are missing out on a goldmine. We needed the walk along Mill Lane to The Alliance by now. Although the conversation had remained sparkly, we were feeling the weight of responsibility – largely in our stomachs – as the mission drew to a conclusion. By the time we reached The Alliance most people had sensibly stopped eating lunch and were perhaps having a cosy pint in front of the football. Not us. No siree. The menu sounded appetising and good value, but we decided to finish as we’d started a week earlier with the beef and the vegetarian option. 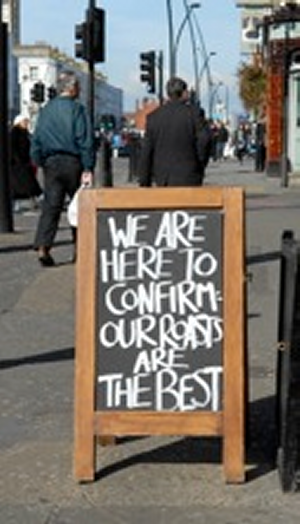 We’d heard good things about the roast dinners here, and although the beef wasn’t exceptional it was perfectly fine. The veggie roast was more than fine, it was damn good and long-time vegetarian (obviously not any more) Claire said it was much better than many she’d had. Ironic then that the potatoes weren’t the best, ranking down with the Westbury’s. 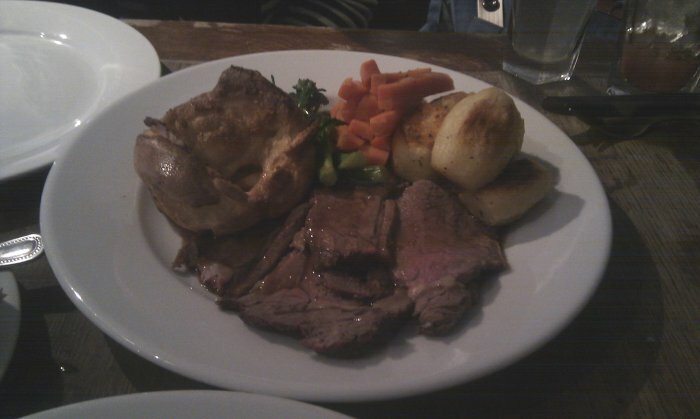 The Yorkshire wasn’t bad either but by this stage we were all well and truly roast dinnered out. 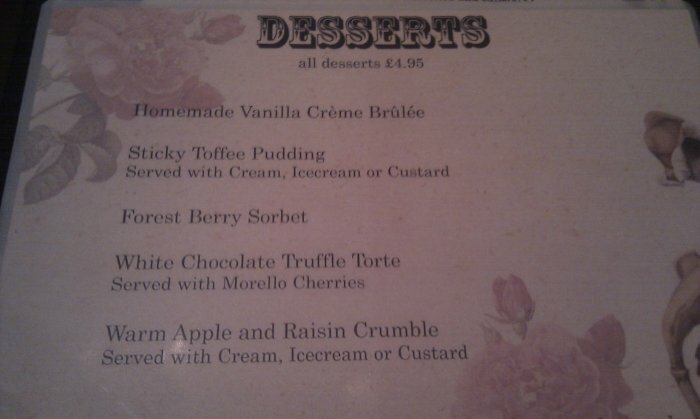 Obviously we had room for pudding. Duh. Plum fools, more crumbles (really really good), a cheesecake and generous cheese plate all found their way down. You can’t argue with the friendly service at The Alliance, and if you’re up that end of town it’s well worth the money – we were also right at the end of their service, so it’s possible that the potatoes might have been better earlier in the day. And although we only tried a couple of non-meat options across both weekends, if there were many veggie dishes better than this then I’d be surprised. 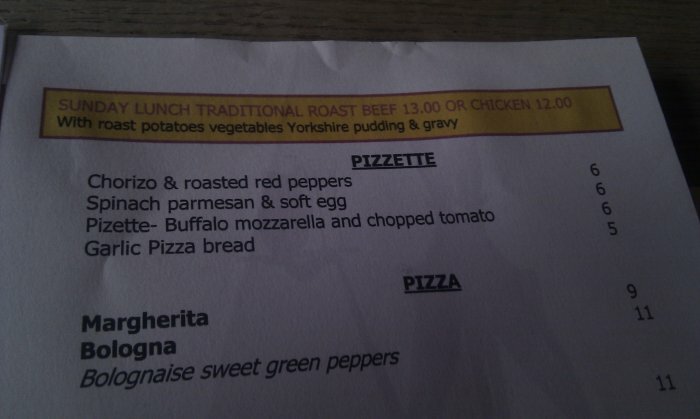 Good value – would try again a bit nearer traditional lunchtime! We were done. We were very full. Kids, don’t try this at home. I have literally no idea how Anna ran to work the next day – I could barely move. West Hampstead summary: Definitely a higher standard overall, although again struggled to say that one place got everything right. The Alice House food was very good, but I wouldn’t want to get there and find the kitchen was shut. 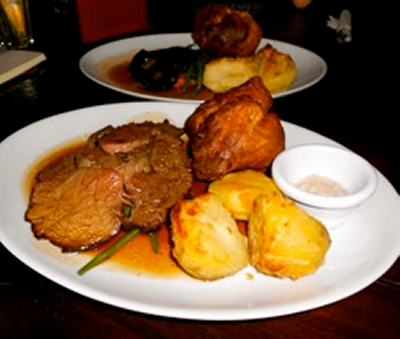 La Brocca’s atmosphere was lively and it delivered top roast potatoes. The Alliance was good value, but I’ll be heading back to The Gallery for that poussin. 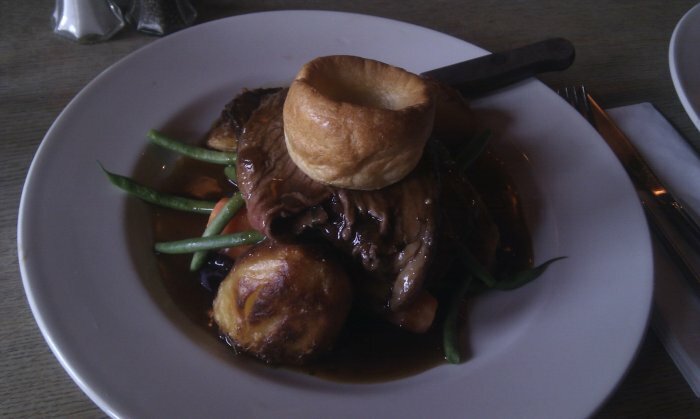 Across both Sundays, the lamb at the Priory and the poussin at The Gallery were my two personal favourite dishes and the beef at The Alice House was my favourite roast beef. 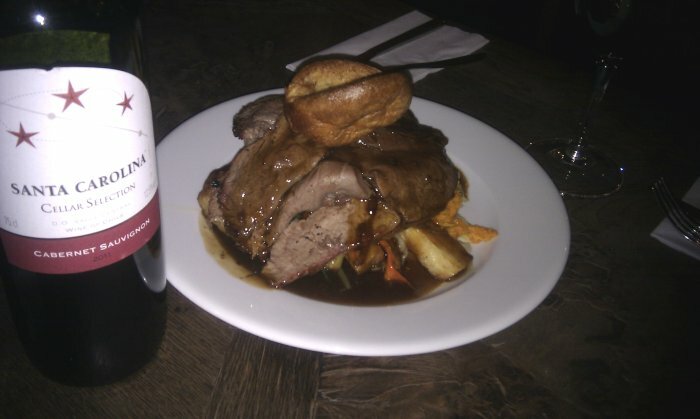 Before you ask… yes, we know there are more places in Kilburn that do Sunday lunch; no, we’re not going to do Hampstead, you can explore the pubs there for yourselves; but yes, we will do one final Sunday lunch field trip when we tackle “The periphery” [update: This is now online]. In the meantime, thank you to Tom, Anna, Claire, and Dom for their company and firm opinions. 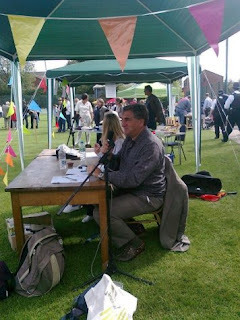 Photos are courtesy of Anna, Claire and me. Sing in spring What have I missed since March 5th?